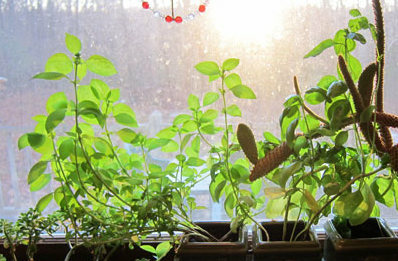 A pot of basil grown in a kitchen window that faces west will keep this area free from negative spirits. The best time to plant an herb garden is when the moon is in Cancer, Scorpio, Libra or Pisces. Any product made from rose oil will not only moisturize your skin, it will also purify and cleanse your skin as well. The feathery leaves of the yarrow were once used in poultices to encourage blood to clot in deep wounds suffered on the civil war battlefields. The lobed leaves of Lady’s Mantle were thought to resemble a Victorian shawl or mantle, hence the name. Placing mint leaves in the toe of each shoe will encourage prosperity in the shoes of the owner. Brides who dream of fields of white clover and yellow daffodils will have long and happy marriages. Rosemary grows best where the lady of the house is ruler. A member of the pea family, licorice produces pale, lilac colored leaves in spring. The Romans used it as a remedy for coughs and asthma. Pregnant women should avoid all contact with pennyroyal. Do not handle it. To discourage mice from tunneling in through the basement, stuff small openings with copper scrubbing pads/discs that have been sprinkled with peppermint or spearmint oil. Stuffy nose? Crush 12 to 15 ripe juniper berries in a bowl, pour a cup of boiling water over the berries, and inhale the steam. A cup of cinnamon tea may help enhance cognitive function and memory. Sip cinnamon tea while studying for a test or exam. MMH makes our day… keeps us healthy and happy…. Thank you for visiting !! It’s always great to see your comments, and I’m happy that you enjoy the blog.